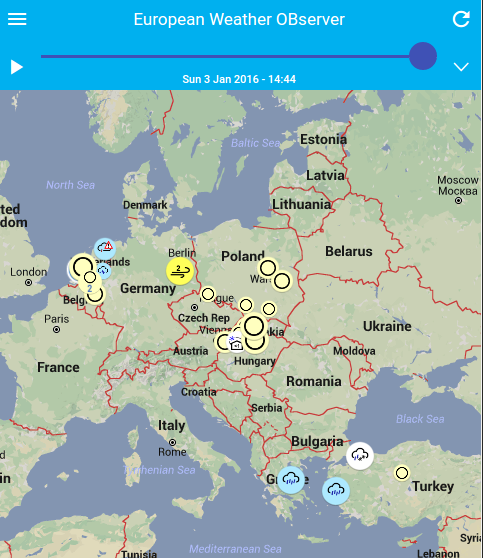 EWOB is a database with reports of weather, severe weather and its impacts. The database is filled by reports replayed to ESSL by itspartners as well as the EWOB app. With the EWOB app, you can report the weather right where you are and see what people in your surroundings are reporting. In this way, you can get an idea of how the weather near you is behaving and be aware early when severe weather approaches. At the same time, you are helping scientists who study severe weather and are giving valuable information to weather forecasters and severe weather warning services. Scientists will use the data to find out how they can best use data from meteorological satellites and radars to best predict severe weather. Weather observations by human beings are indispensable to develop relationships between what satellites and radars see and what kind of weather is actually happening on the ground. Weather forecasters have to deal with the problem that satellites cannot see what happens under a storm cloud, radars do not scan close to the earth’s surface and that measurements from their observation stations are far apart. EWOB allows them to be aware that, e.g., a thunderstorm started to produce wind damage, or that the rain suddenly started to freeze on the road, which is crucial information for issuing timely weather warnings. The ESSL team hopes that you will report often and thanks you for contributing to this community effort! The reporting options of the latest version you can find in a PDF document here. If you are interested in using EWOB data for research or other purposes, we invite you to contact us. Our e-mail address for any questions, requests or comments is ewob@essl.org.